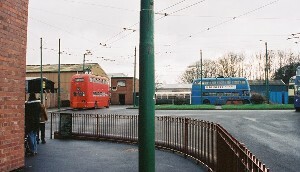 Until early 2011,the Black Country Living Museum had the only double deck trolleybus route left in the world. 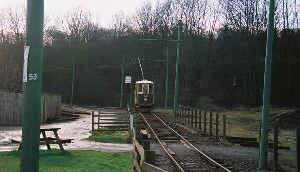 On Sundays and Bank Holidays from Easter to Christmas a service operated taking visitors to and from the various points of interest on the 26 acre site. Unfortunately, due to thieves stealing part of the copper overhead wires, operation ceased at the end of 2010. However operation has now been resumed. 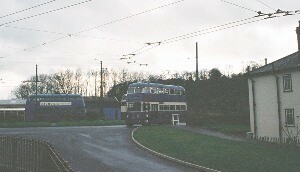 The start of the route is the top turning circle (862, 237 and 735 are pictured here parked up). Having come from the stop just before the depot, the bus had to stop before descending the hill as a safety measure. 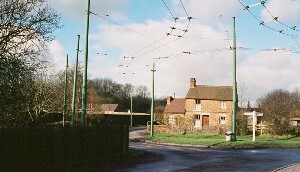 Between the stop and the Iron Houses (about where 862 is on the photograph) is a dead spot where the depot wires join the route. This had to be coasted through. The hill going down to the coal mine stop. The return stop can be seen in the photo, but the otward stop is just off picture. 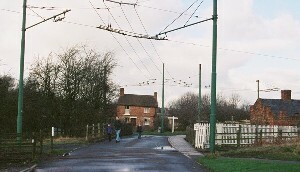 This was usually taken with one notch of electric brake as one of the main paths from the entrance building crosses the road at this point and the stop was a compulsory one. 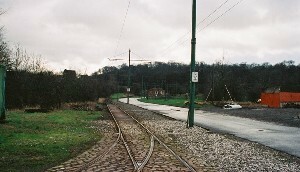 The tramway also crosses the road at this point. 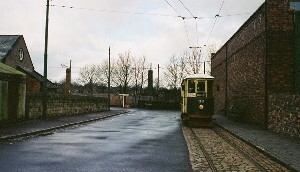 Here, Tividale car no 34 is seen heading for the tramway mine stop. From the mine stop, we headed towards the bridge over the stream running through the site. 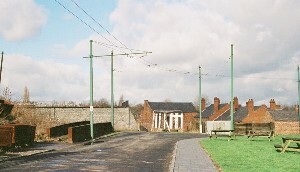 The tramway crossing can be seen in the foreground and immediately after the bridge, the roadway splits and the route took a one way loop round the site. There was a 5mph speed limit going under the crossing in the overhead, too fast through here and the poles would be off. Just over the bridge at the Tilted Cottage, we had a sharp left hand bend followed almost immediately by a right hand bend. Just to make life more interesting, there was a request stop here as well. In fact, you can probably just see the green stop sign on the traction pole (count 4 traction poles from the left). There are quite a few blind spots here, so it was a case of going carefully. Once out of the S-bend, we were on the Back Road, which did mean you could put your left foot down a bit and then coast all the way to the corner. 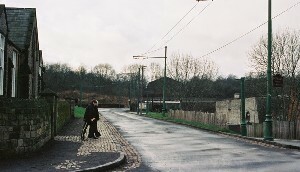 There was a request stop at the Lenches Oliver Shop, which wasn't often used and a picnic area on the right at the corner, a sharp eye needed to be made for wandering pedestrians. This view is very different now with the Institute and park occupying the empty land on the left and the new row of shops on the right alongside the causeway, now named "Birmingham Street". At the end of the Back Road we had a compulsory stop before a very easy corner onto the Causeway. In front are the pigeon lofts and the turn to the left is a rough track to the lime kilns. 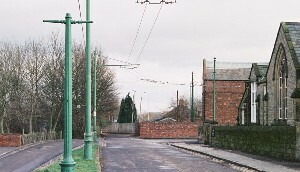 The large iron pieces on the left hand side of the road are the missing sections of the bridge over the canal leading into the village itself. There are steps down to the bridge just past the corner. Once round the corner, we were on the Causeway. This view is from Schoolroom Corner and we can just see the end of the Back Road in this shot. 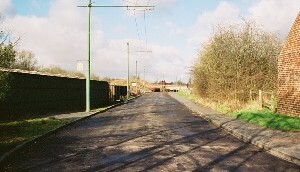 The track down to the village can just be seen on the right hand side. The left hand side is now occupied by a row of shops set in the 1930s. 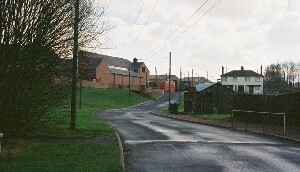 At the end of the Causeway, we have St James' School and the tight turn into the Village terminus. To get round safely, we had to steer left to dip the nose of the bus into the roadway on the left and then hard right to get round and into the stop. Cutting this corner was a guaranteed dewirement. Added to that it was a danger spot for pedestrians, as they tended to wander up from the village, run out of the school or panic and run in front of the bus to get to the stop. Once round the corner, we had the second terminus. As these shots were all taken during the winter, when the trolleybuses did't run, 34 had the stop all to itself. This is the closest we got to the Black Country Village itself, which is a very short walk down the path in the background. Leaving the lower terminus, we had a nice fast piece of roadway up to the Tollhouse, with the tramway running on its reserved track to the left. When there's few pedestrians about, this was a fast run, but it could be another danger spot as there's no pavement. At the end of this road we came back to the bridge. We'd been here before! At the tollhouse, we came round the corner and came in to the compulsory stop at the mine, again observing the 5mph limit through the crossing. Having left the mine stop, we then had take the hill on full power, which showed the trolleybus to its full advantage. This was another danger point for pedestrians, so the horn was always sounded on approaching the corner at the top. At the top, the bus should have had enough speed to coast safely into the stop. Here we see it occupied by D9 5342 (6342HA). We'd now done the round trip of 0.8 miles.